NEW!!! CLICK ON THE “FOLLOW” LINK AT THE RIGHT TO GET EMAIL NOTIFICATION WHENEVER THE WEBSITE GETS UPDATED!!! The Blue Lake Preservation Association is a not-for-profit organization dedicated to the protection and preservation of Blue Lake, one of the clearest lakes in Wisconsin’s Northwoods. Wildlife is abundant here. Blue Lake is home to loons, eagles, owls, herons, deer, fox, squirrels, bears and more! Located approximately one mile south of Minocqua, Blue Lake is a haven for fishing, boating, waterskiing, canoeing, kayaking and swimming. Residents pride themselves in keeping Blue Lake pristine. Please check our Lake Management page for more information on our efforts. Our loon friends return to Blue Lake year after year, never disappointing with daily entertainment. We are fortunate to have two nesting pairs on the lake who have made their homes on artificial nesting platforms. For more information on loons and their nesting behavior click here. And always remember to keep well away from nesting loons and make a point of letting your guests know as well. 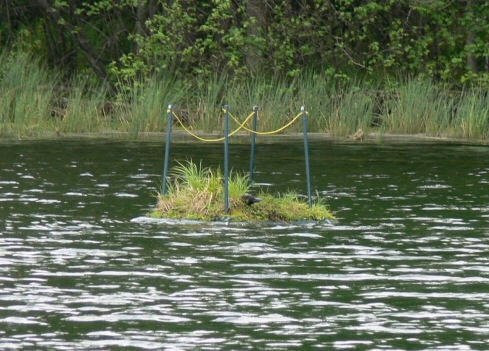 Fishermen should take special care to avoid fishing near loon nest sites. Recently a banded loon was admitted to Northwoods Animal Hospital with 2 hooks and 100 feet of braided line. They were able to remove the hooks & line endoscopically with the help of a local gastroenterologist. The lesson here – don’t fish near loons – spread the word! Please take a moment to click on the Lake Courtesy Code as a reminder how you can be respectful to all our human and wildlife neighbors, Oneida County Lakes Courtesy Code. If you’re a resident or a guest of Blue Lake, you’ll find this website to be a valuable resource. For up to date lake news and announcements please check the News and Events page. We pride ourselves in being good stewards of the lake and these pages are full of information on how we can keep Blue Lake as pristine tomorrow as it is today. This website (the “Website”) is provided by the Blue Lake Preservation Association (the “BLPA”) for general information purposes only and is not intended to address specific circumstances of any individual or entity. The BLPA makes no representation or warranty of any kind, expressed or implied, with respect to any information contained in this Website. You assume total responsibility for and risk of your use in any way of this Website. Any link to any external or third party website is provided solely for your convenience. By following any link to any other website you do so at your own risk and the BLPA and this Website neither undertake nor accept any liability for any linked website or its nature, content or availability. No link from this Website to any external or third party website constitutes, means or implies that the BLPA endorses or accepts any responsibility for the content or use of such website. The BLPA does not make any representation or warranty regarding the quality, safety, suitability or reliability of any external or third party website or any content or materials contained therein. In addition, any views, opinions or recommendations expressed or contained in any external or third party website are solely those of the website and its authors, and the BLPA does not endorse, agree with or otherwise recommend any of those views, opinions or recommendations.